I’ve been using Synergy for quite a while now and I find it extremely useful. I’ve demonstrated how I use Synergy and simplified my life by keeping the monitors and using one keyboard and one mouse across different computers. 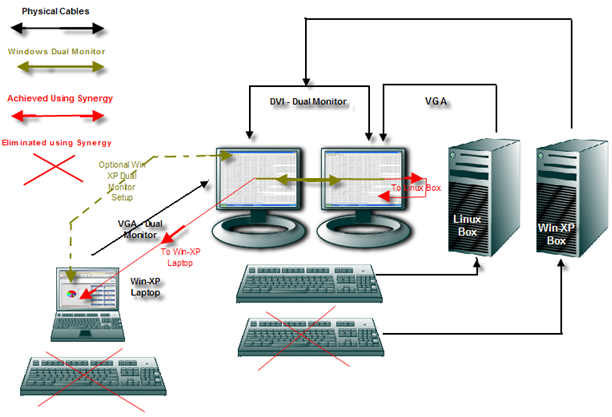 What I’ve done, is used my primary KB and Mouse across my Win-XP Laptop, Win-XP Desktop and Cent OS (Linux Box). So, I installed Synergy on all computers and configured Synergy with my Win-XP Desktop as the server and the clients which are my Laptop and Linux box share the server’s KB and mouse. Start up your Synergy server and Synergy clients and thats it! What I also love about Synergy is the ability to copy, paste between computers. Yes – RDP does it too, but again if you want to use other monitors and share the same KB and mouse then this is really fantastic. It’s a really cool tool. If you’re wondering about .pssx file extension – it’s a presentation saved using Powerpoint 2007. To open it simply download the Microsoft Office Compatibility Pack for Word, Excel, and PowerPoint 2007 File Formats and install it. 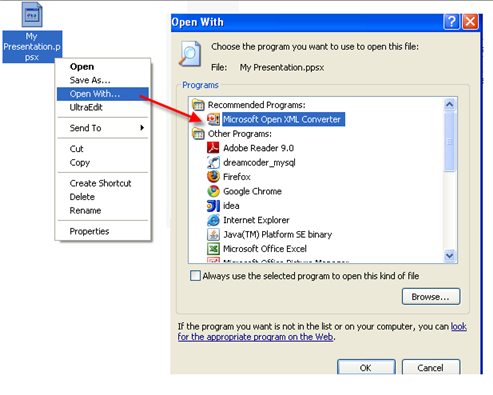 Then, Right click on the Document to open, Select Open With… and chose Microsoft Open XML Converter to view the contents of the file. I was trying to increase eclipse heap size and setting it to 1024MB and that wouldn’t work. Reducing it to 768MB did the trick for me. Later, after installing Your Kit Profiler and trying to add a plug in for eclipse, I started seeing the same error. So I opened up the eclipse.ini and removed the –launcher.XXMaxPermSize 256m option.